How do we extract reactive metals that cannot be obtained using carbon? Why do we need to use electrolysis to obtain certain reactive metals from their ores? e.g. how do we extract aluminium from its bauxite ore containing aluminium oxide? How do we extract sodium from salts like sodium chloride? All the electrolytic process are described complete with the electrolysis electrode equations. Scroll down for revision notes on extraction procedures and theory which should prove useful for school/college assignments/projects on ways of extracting metals from their ores. These revision notes on the electrolytic extraction of aluminium from bauxite ore should prove useful for the new AQA, Edexcel and OCR GCSE (9–1) chemistry science courses. The current method for extracting aluminium is expensive because it involves several stages and uses large amounts of costly electrical energy. It is much more expensive than using carbon reduction to make iron in a blast furnace. Aluminium is very abundant in the Earth's crust but it is always found as very stable compounds in many sources e.g. bauxite (mainly aluminium oxide) and alumino-silicate minerals in many rocks. Bauxite has the highest concentration of aluminium in these sources and is mined extensively around the world. Reminders: Electrolysis (of aluminium oxide) is a way of splitting up (decomposition) of the compound (aluminium oxide) using electrical energy. The electrical energy comes from a d.c. (direct current) power pack supply. A conducting liquid, containing ions, called the electrolyte (molten aluminium oxide), must contain the compound (aluminium oxide) that is being broken down. The electricity must flow through electrodes dipped into the electrolyte to complete the electrical circuit with the battery. Electrolysis can only happen when the circuit is complete, and a d.c. electrical current (electricity) is flowing, then the products of electrolysing molten aluminium oxide are released on the electrode surfaces where they can be collected. Electrolysis always involves a flow of electrons in the external wires and electrodes and a flow of ions in the electrolyte and there is always a reduction at the negative cathode electrode (which attracts positive ions, cations) and an oxidation at the positive anode electrode (which attracts negative ions, anions). The basic design of the industrial electrolysis cell used in the extraction of aluminium from molten purified aluminium oxide extracted from bauxite ore. The process of electrolysis uses of large amounts of energy in the extraction of a reactive metals and makes aluminium expensive to produce. Aluminium is a very useful metal but expensive to produce. Aluminium is theoretically a very reactive metal, so, because its position in the reactivity series of metals, aluminium cannot be extracted using carbon because it is above carbon in the reactivity series ie more reactive than carbon in the series. Carbon is not reactive enough to displace aluminium from its compounds such as aluminium oxide. So, if aluminium is too reactive to be obtained by carbon reduction of its oxide another method must be employed which is called electrolysis. Aluminium is obtained from mining the mineral bauxite which is mainly aluminium oxide (Al2O3) and bauxite must be purified prior to electrolysis, adding to the manufacturing costs. The purified bauxite ore of aluminium oxide is continuously fed in. The mineral cryolite is added to lower the melting point and dissolve the ore. So the electrolyte is a mixture of molten aluminium oxide and cryolite minerals. The melting point of aluminium oxide is over 2000oC and it would require a lot of extra energy to keep purified bauxite ore molten for the electrolysis to take place - remember the ions (Al3+ and O2–) must be free to move to electrodes for the electrolysis to work. Ions must be free to move to the electrodes called the cathode (–, negative), attracting positive ions e.g. Al3+, and the anode (+, positive) which attracts negative ions e.g. O2–. When the d.c. current is passed through aluminium forms at the negative cathode (metal*) and sinks to the bottom of the tank where it can tapped off, collected and run into moulds to cool down before transportation to it will be used to make things. The waste gases; At the positive anode, oxygen gas is formed (non–metal*). This is quite a problem. At the high temperature of the electrolysis cell it burns and oxidises away the carbon electrodes to form toxic carbon monoxide or carbon dioxide. So the carbon–graphite electrode is regularly replaced and the waste gases dealt with! Cryolite reduces the melting point of the ore and saves energy, because the ions must be free to move to carry the current and less energy is needed to melt the aluminium oxide obtained from the bauxite ore.
Electrolysis reminders – the negative electrode (–) is called the cathode and attracts positive ions or cations e.g. Al3+, and the positive electrode (+) is called the anode and attracts negative ions or anions e.g. O2–. Read the following in conjunction with the 'concept diagram' for the electrolysis of molten aluminium oxide, after the electrode equations. The negative cathode electrode attracts positive ions, the aluminium ion. This is a reduction - electron gain. It might look a bit different from an iron ore reduction equation, but this is the equation that precisely expresses the reduction of an aluminium ore to aluminium metal. The positive anode attracts negative ions, the oxide ion. At the positive (+) anode, oxidation takes place (electron loss) when the negative oxide ions are attracted to it. They lose two electrons forming neutral atoms, which combine to form oxygen molecules. This is an oxidation - electron loss. Note that the aluminium oxide loses its oxygen, therefore in this electrolytic process the compound aluminium oxide is reduced to the metal aluminium. This e– flow from the +ve to the –ve electrode perhaps doesn't make sense until you look at the electrode reactions, electrons released at the +ve anode move round the external circuit to produce the electron rich negative cathode electrode. Electron balancing: In the above process it takes the removal of four electrons from two oxide ions to form one oxygen molecule and the gain of three electrons by each aluminium ion to form one aluminium atom. Therefore for every 12 electrons you get 3 oxygen molecules and 4 aluminium atoms formed. This means you can do mole ratio product calculations. About 39% of the aluminium in foil, car components etc. is recycled aluminium. This makes good economics because recycling saves on costs AND allows a mineral resource like aluminium's bauxite ore to last a lot longer – slower depletion of the Earth's mineral ore resources will make it last longer. So, scrap metal merchants are doing a roaring trade at the moment. The savings are partly reduced by the cost off collecting waste/scrap metal and purifying for further use. It is estimated that recycling aluminium only uses 5% of the energy required to extracted the same mass of aluminium from its ore – the original aluminium extraction uses very expensive electrical energy for the electrolysis. The social, economic and environmental impacts of exploiting metal ores including RECYCLING are further discussed on a separate page. Aluminium is very useful metal and used as a lightweight construction material eg greenhouse frames. Aluminium can be made more resistant to corrosion by a process called anodising. There is a note about the bonding and structure of alloys on another page. The process of electrolysis uses of large amounts of energy in the extraction of a reactive metals like sodium, potassium, magnesium and calcium etc. and makes them expensive to produce. Because its position in the reactivity series of metals, sodium cannot be extracted using carbon, sodium is above carbon and cannot be displaced by it. So, sodium is too reactive to be obtained by carbon reduction of its oxide and another method must be employed which is called electrolysis. Sodium, like many of the most reactive metals, can be extracted by electrolysis of its molten chloride. This can be done in the 'Down's Cell' shown in the diagram. Electrolysis reminders – the negative electrode (–) is called the cathode and attracts positive ions or cations e.g. Na+, and the positive electrode (+) is called the anode and attracts negative ions or anions e.g. Cl–. The ore–compound containing the sodium (or other metal) must be molten so the ions are free to move to the electrodes. The conducting melt is called the electrolyte. In the molten salt the positive sodium ions migrate to the negative cathode electrode and are reduced by electron gain to form liquid sodium atoms. The negative cathode electrode attracts positive ions, eg the sodium ion. This is electron gain, a reduction, so reduction of a sodium compound to give the free metal sodium. 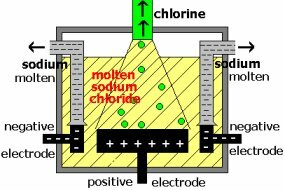 Equally mobile in the molten chloride salt are the negative chloride ions, which migrate to the positive anode electrode and get oxidised by electron loss to form green chlorine gas molecules. Initially two chlorine atoms are formed and these rapidly combine to give chlorine molecules. The positive anode attracts negative ions, eg the chloride ion. Other very reactive metals like lithium, potassium and calcium can be extracted in the same way by electrolysing their molten salts. As you can see from the diagram on the right, all these metals are above carbon in the reactivity series and cannot be displaced by carbon.